Happy Friday everyone! Today I have 3 of the Models Own Speckled Eggs polishes to share with you! It’s super exciting for me cause these are the first Models Own that I’ve tried – all thanks to Katie from Harlow & Co! In case you’re wondering, Harlow & Co is one of the first Canadian e-tailers to carry Models Own products along with many other otherwise hard to get unique polish brands. The Speckled Eggs collection was released a while ago and of course they were great for Easter. Unfortunately, I was swamped by final exams so I didn’t have a chance to show them to you back then. 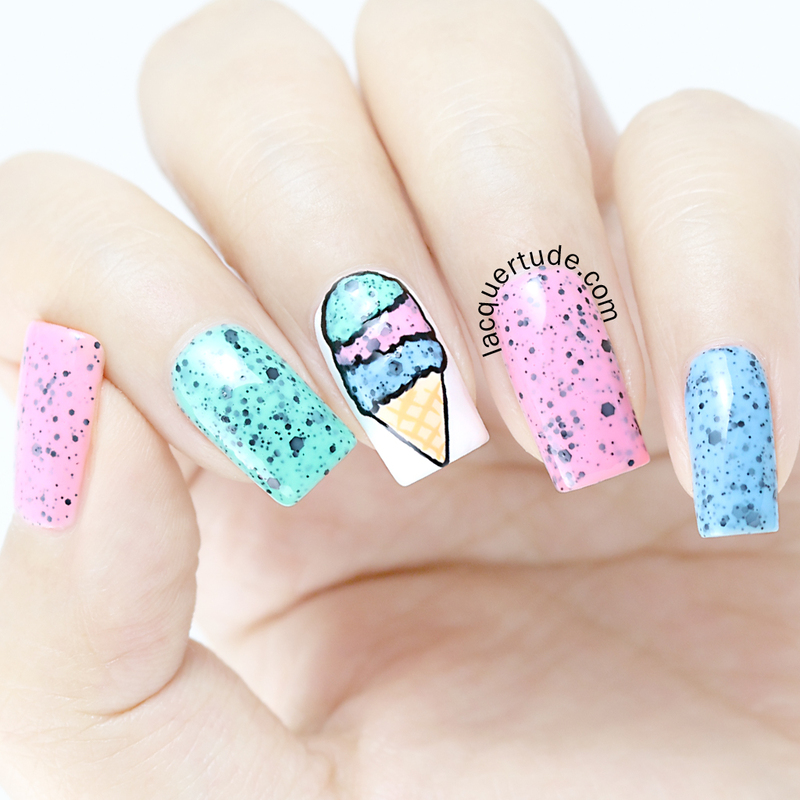 Since I’m sure you’ve already seen them lots as Easter eggs, I was thinking of a unique twist that I can offer you to wear them all year round, well I realized that they’re absolutely ideal polishes for “Ice Cream Nail Art”!! So, that’s what I did here. This is SOOO CUTE! Not to toot my own horn, but I fell in love with it before I finished painting it! Seriously, I was giggling over the deliciousness of the ice cream cone! I love my ice cream with huge scoops that look like little tasty umbrella tops on the cone. Is this how you like your ice cream too? The formula was really great, for all 3 polishes, I applied a thin first coat, then once dry, I followed with a medium second coat and voila, they reached full opacity! Δ Index: Models Own Mag Pie – OR “Mint Oreo”! Nom nom nom…this is definitely my favorite in the collection! Δ Ring: Models Own Dove – OR “Strawberry Cream”! Mmmmm…delicious and sweet! Δ Pinky: Models Own Duck – OR “Blueberry Cream”! Beautiful and healthy!! Δ Ice Cream: Painting it was actually very simple. I used a black liner to rough out the outline of the scoops and the cone, then I filled in the color. 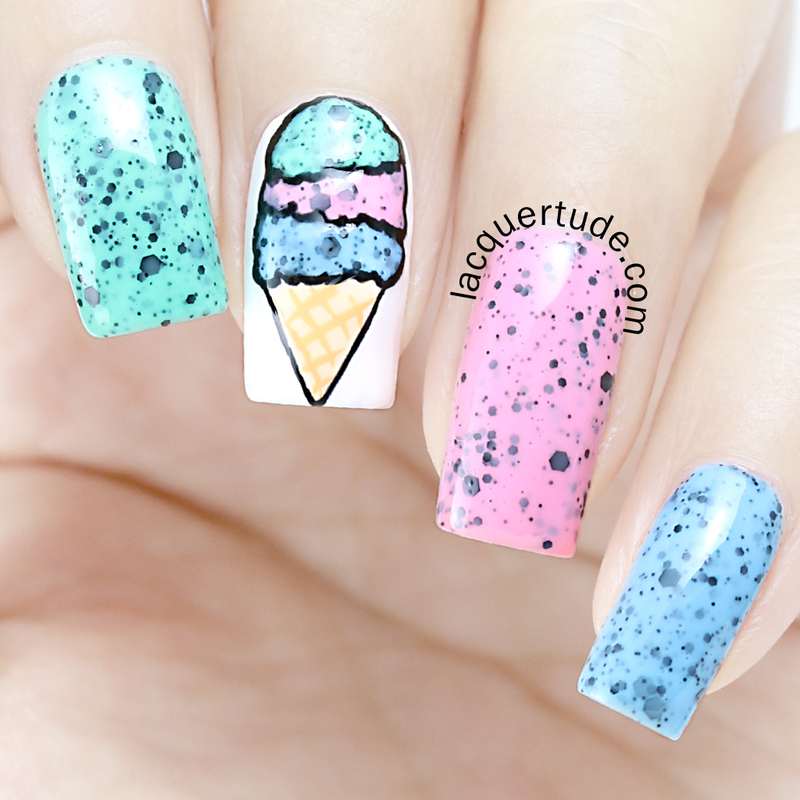 I used all 3 of the Models Own as the ice cream scoops and the cone is done with Lime Crime Milky Ways and Peaches ♥ Cream, which I bought last year, also from Harlow & Co and used before in my Herringbone Nail Art (click here to see my post and tutorial!). Once I was happy with the colors, I outlined with black again then topped it off with one coat of Glossy Glam Top Coat. These Lime Crimes were exactly what I pictured for my ice cream cone. So, everything worked out really well! I have to say that I need a lot more practice to photograph in natural day light. 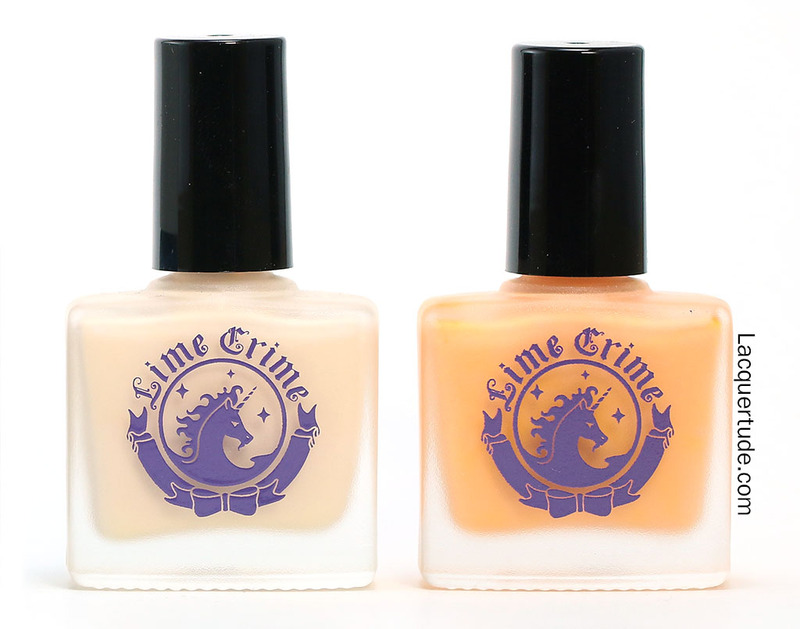 But, I love how it gives you the comparison of how the polishes look over the above photos, which were all shot in my light box. What do you think? Do you own any of the Models Own Speckled Eggs polishes? Now that I’ve tried these, I am seriously lemming the Models Own Polish For Tans Collection! I might have to visit Harlow & Co soon! Thanks so much Anna! Yeah, I’m super excited about the Polish for Tans too! I am lemming for these polishes so bad! 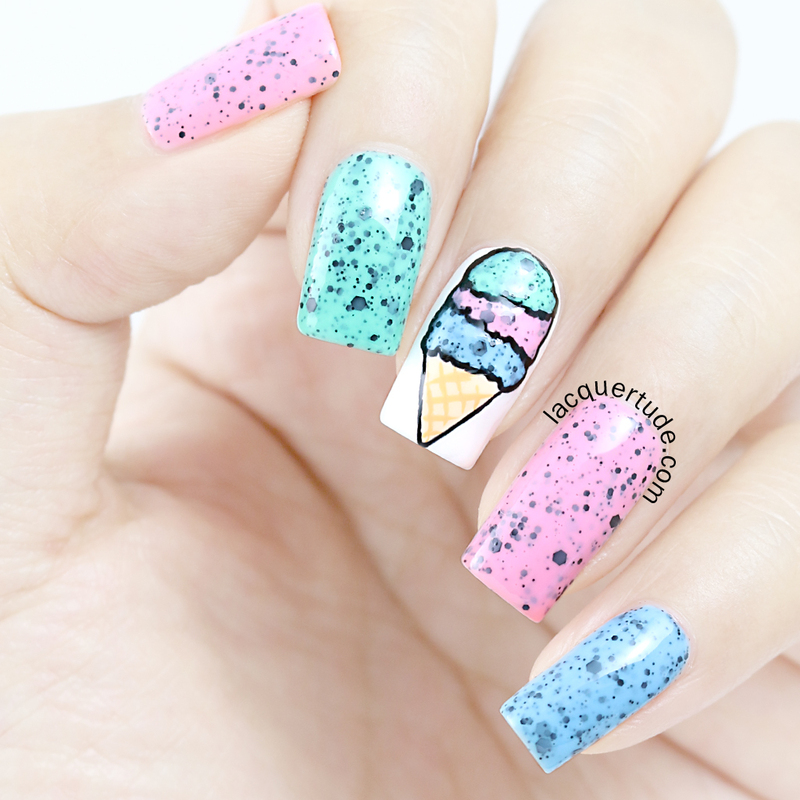 I love the ice cream accent nail, so cute!